Metal Bonding Adhesives Market size valued at over USD 3.7 billion in 2017 and is likely to register a prominent CAGR of close to 6.3% to 2025. Metal bonding adhesives market is mainly driven by its increasing applications ranging from design and production to repair, maintenance and field services. These composite are present in different viscosities, chemical resistances, electrical properties, cure times, colors, etc. It possesses characteristics such as abrasion resistance, vibration resistance, dimensional stability, thermal conductivity, low shrinkage, low outgassing and low coefficient of expansion. Recent developments in the automotive industry, new potential uses of adhesives to economically replace mechanical fastening such as welding, brazing or riveting and many other trends will strengthen the metal bonding adhesives market growth. For example, In the aircraft industry, metal bonding adhesives enable the use of thin metal & honeycomb structures more workable because stress bearing is transmitted more effectively by adhesives rather than by welds or rivets. The new developments of industrial plants being installed and flourishing infrastructure developments in the developing markets are in favor for modern, state-of-the-art bonding and fastening techniques. These trends will result in emergence of new environmentally compatible adhesive systems having higher solids contents, like water based or hot melt products. Uniformly growing GDPs combined with rising per capita income of people of developing nations and increased usage of adhesives in several end-use industries such as aerospace, defense, electronics and pharma are key factors accounting for growth in metal bonding adhesives market share. The product is used in the healthcare industry for bonding purposes in dialysis machines, imaging & X-ray equipment, filters and needle bonding. Rising demand for sustainable products that have low volatile organic compound (VOC) concentration, will generate lucrative opportunities for medium to small scale manufacturers. However, volatility in availability and prices of raw materials required in product manufacturing, will likely affect the metal bonding adhesives market. On the basis of resin type, the global metal bonding adhesives market has been segmented into epoxy based, polyurethane based, acrylic based and others such as silicone based, polysulfide based, cyanoacrylate, modified phenolic based etc. Based on volume, the epoxy segment is said to hold the maximum share of over 40% due to its significant usage in automotive, optical, medical, chemical processing, electronics and other industries. The product also has extended application in aerospace industry for fabricating satellite repair & assembly, solar arrays & panels, honeycomb parts & bonding, rotor blades and braking systems. Thus, epoxy-based products are widely considered in producing light-weight and durable components. Based on revenue, the acrylic segment held a substantial metal bonding adhesives market share of more than 25%. Acrylic based adhesives are ideal for extended UV exposure and high temperatures, while offering long-term stability and solvent resistance. Polyurethane adhesive is poised to gain moderate market share from 2018 to 2025. 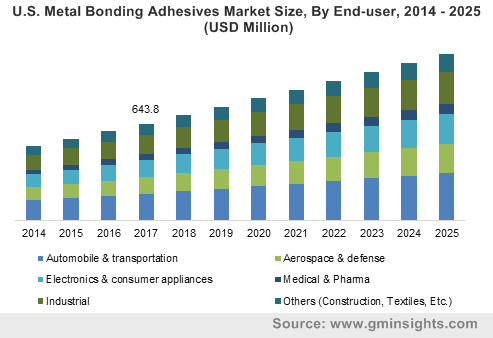 The global metal bonding adhesives market has been segmented on the basis of end-user into automobile & transportation, aerospace & defense, electronics & consumer appliances, medical & Pharma, industrial assembly and others. The others segment includes construction, textiles, etc. In 2017, automobile & transportation segment held a prominent share of more than 25% of the global metal bonding adhesives market. The product is broadly used in automobile & transportation industry by original equipment manufacturers for fabricating its chassis, automotive exteriors, panel bonding, frames & reinforcement etc. of passenger as well as heavy vehicles. The industrial assembly segment is the next largest end-user in the metal bonding adhesives market. Metal bonding adhesives are used as an alternative to conventional bonding for sealing, heat treatment and fastening. It has large-scale employment in industrial assembly such as reciprocating machinery, machine base plates, reaction injection molding machines, ultra-centrifuge rotors, and cooling water pumps. This trend is projected to boost the overall industry growth during the forecast spell. Based on revenue, Asia Pacific metal bonding adhesives market will witness significant growth owing to growing demand for technologically advanced consumer electronics and automobile production in China that held a regional market share of over 25% in 2017. Recovery in the industrialized nations and a strong upswing in the emerging markets of China, India, Vietnam, Thailand and Indonesia will augment investments in food & beverages and oil & gas industries. 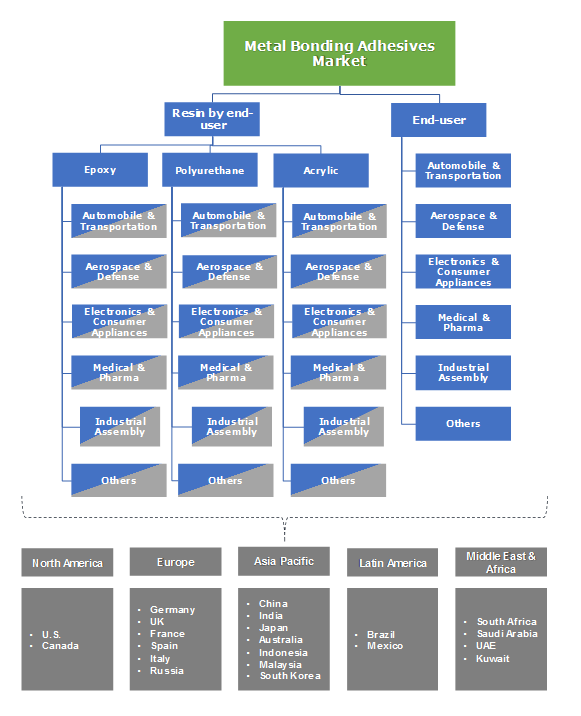 In addition, relocation of manufacturing hubs due to accessibility of cost-effective raw material and labor in India, Thailand, Indonesia and China, coupled with increasing investments by multinationals in automobile sector and growing competition among market players to hold a manufacturing base in APAC are major aspects stimulating the revenue outflow of metal bonding adhesives market size in the region. For instance, the central government of the People's Republic of China initiated 46 pilot projects, with main stress on technological advancement to enforce smart manufacturing as part of its ‘Made in China 2025’ initiative. BASF SE, Sika AG, Henkel AG & Co. KGaA, DowDuPont Inc., H.B. Fuller, 3M Company, Evonik Industries, Ashland Inc., Arkema Group, Huntsman Corporation, Solvay S.A., DELO Industrie Klebstoffe GmbH & Co KGaA, LORD Corporation, Permabond LLC, Parson Adhesives Inc., In 2017, H.B. Fuller announced that it has opened its new Automotive Competency Center in Germany. This facility includes an applications laboratory and expanded sales. This center expands the company’s ability to expand and manufacture water based, hot melt, solvent based, reactive adhesive technologies for diverse automotive, structural, lighting, trim, electronics, electric vehicle and battery applications. Metal bonding adhesives has pandemic usage in automotive, aerospace, industrial assembly, etc. Furthermore, increased disposable earning will drive the private vehicle ownership, that will eventually increase overall automobile production at a global scale. Lucratively elevating product demand in electronics and automotive industry on account of dimensional stability, shock resistance and peel strength, will further propel metal bonding adhesives market industry. Further, product application in medical industry due to low cryogenic is expected to drive growth.